By the time I had turned 40 I did not care what people thought. Some people might say I was born that way, but I always made allowance for other people’s opinion, although I may not have outwardly shown it. When I turned 40 I had a weekend party at Mbona for friends and family. Although I have written about that day before the days of blogs, 9 years later my memories of that day have changed. They have softened, become warm and melancholic. Today is the third anniversary of my father’s death. My father embraced the idea of a party at Mbona. He got to spend time with his old friends, Rod Conacher, and with his new friends, Gigi and Mr Casciola. I do not remember what happened on the Saturday morning but it must have been organisational. There were tables to set, caterers to organise and good weather to pray for. I remember lunch was perfect, with good food, crisp wine and clear skies so warm we had to raise the sides of the marquee. Whichever direction your eye fell there was a vista of grass or trees, a hill or lake, covered by an unusual blue sky in August. Before dessert I had arranged for someone at each table to speak. My father spoke for his table, but I do not remember what he said. I felt good when he spoke, that I do remember. I felt good when everyone spoke. 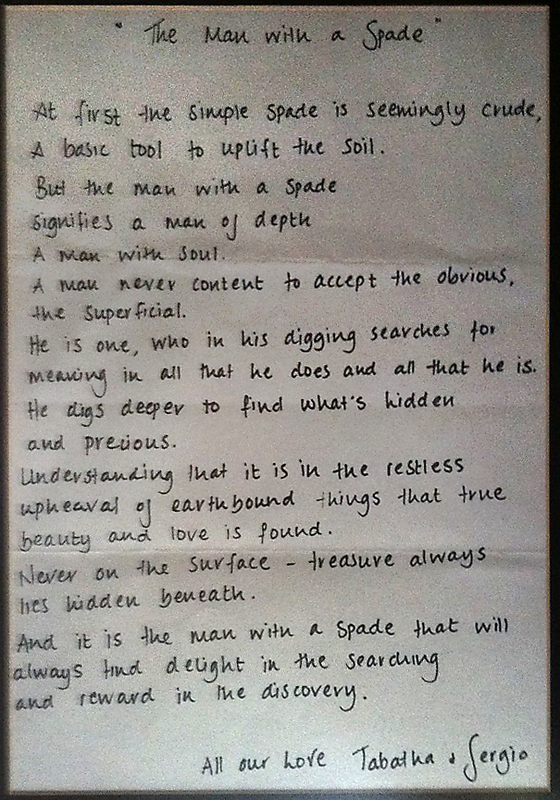 The easy part to remember was the poem Tabatha wrote for me, “The Man with the Spade”. After lunch the drummers arrived. They parked on the lawn away from the house and all the children descended on the brightly coloured drum covers like bees on flowers. They helped unzip the covers and placed the drums, different sizes, in a circle. As they did a few African notes escaped, some single, some in tune, into the grasslands. I could see my father was apprehensive. This was not the sort of thing he had expected, but he was game. He sat in the circle, made some comments, checked his drum and started tentatively until he realised he could put on a show. 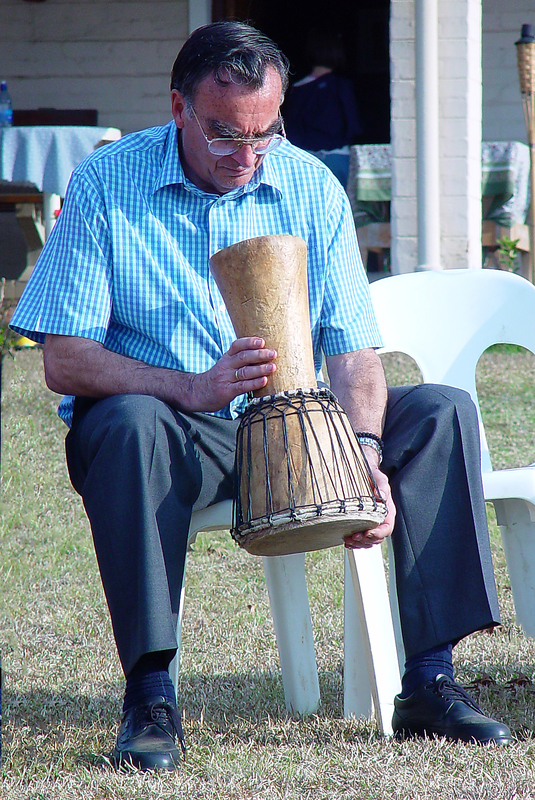 By the time the two or three drumming sessions were complete he was the centre of attraction and everyone was enjoying the experience. Then drumming was not enough, so he found two walking sticks and decided to do a Zulu dance. 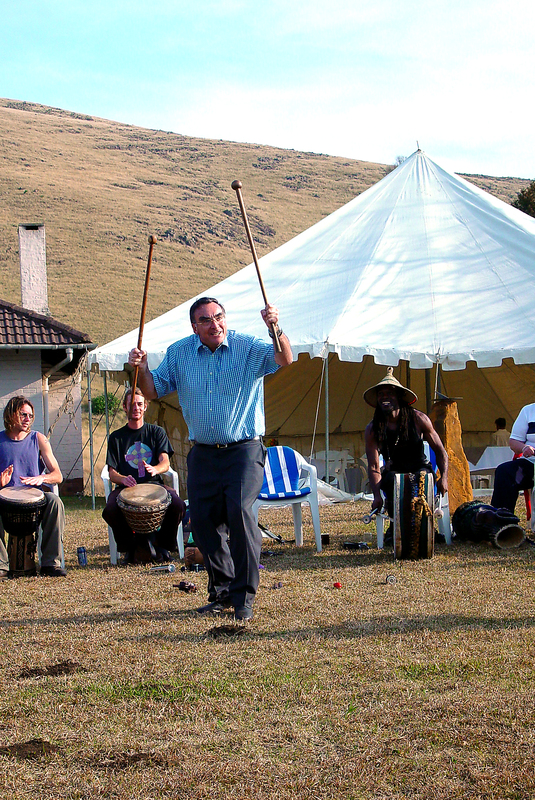 I am sure if we had the music he would have progressed to a Kalamatiano, and had everybody swirling around the flat lawn in the mountains. He made his Arcadia wherever he went.